In episode 44 of Fresh Tracks I speak with author, iHeart radio show host and sales expert Judy Hoberman about sales. Judy shares insights on her brand, Selling in a Skirt, and teaches in-depth on her S.K.I.R.T philosophy. There is no getting away from sales as an entrepreneur, yet many of us struggle because we don’t feel comfortable selling or we feel we aren’t being in integrity with ourselves by ‘selling’ to others. Judy busts those ancient sales myths and that yucky salesy feeling and shares how bringing some old fashioned relationship building to the conversation changes everything. Don’t let ‘the triangle’ intimidate you, it’s not in Bermuda – Judy’s simple ‘strategic triangle’ will help everyone that suffers from bright shiny object syndrome stay on track when new opportunities present themselves! From being realistic in your goal setting to creating a one-page business plan, Judy helps simplify making money and connecting with clients on this week’s show! Judy Hoberman, President of Selling In A Skirt is here to help you take the negativity out of selling. Her 30 years in sales has given her both the knowledge and sense of humor about the gender differences that we should all understand and embrace instead of feeling unable to communicate. Judy is the author of “Selling In A Skirt”, “Famous Isn’t Enough” and “Pure Wealth”, business books for Professional Women, Sales Executives and Entrepreneurs. 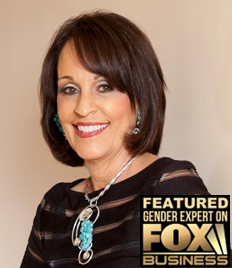 She is the host of a weekly radio show on The Women 4 Women Network/iHeart Radio called Selling In A Skirt and is also featured as “The Gender Expert” on Fox News Radio.